Ms Dace Briede Zalite was acting as my leadership coach during the period 17.06-21.07.2016. 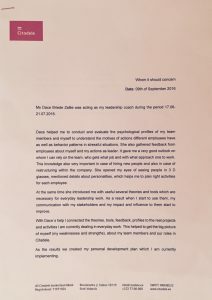 Dace helped me to conduct and evaluate the psychological profiles of my team members and myself to understand the motives of actions different employees have as well as behavior patterns in stressful situations. She also gathered feedback from employees about myself and my actions as leader. It gave me a very good outlook on whom I can rely on the team, who gets what job and with what approach one to work. This knowledge also very important in case of hiring new people and also in case of restructuring within the company. She opened my eyes of seeing people in 3 D glasses, mentioned details about personalities, which helps me to plan right activities for each employee. At the same time she introduced me with useful several theories and tools which are necessary for everyday leadership work. As a result when I start to use them, my communication with my stakeholders and my impact and influence to them start to improve. With Dace`s help I connected the theories, tools, feedback, profiles to the real projects and activities I am currently dealing in everyday work. This helped to get the big picture of myself (my weaknesses and strengths), about my team members and our roles in Citadele. As the results we created my personal development plan which I am currently implementing. Dace is a great professional, very supportive and at the same time result oriented. I am very grateful for the coaching and suggest this kind of training to every leader.